You know who else couldn't beat Japan? The Mongols. Now it's us and them in the loser's bracket, and they mad. Any thoughts on the game rules? I'm in!, I think a plains map would make an interesting tactical challenge. Is there an option to make teams group together without an island map, like east v. west on the grasslands? I've never tried any of the maps of that style, and I'm not certain how they work. If nothing else, we can set up a custom map and make sure it's that way. But I'm up for any options that are less work if anyone has ideas. Because I'm a dumb and clicked the announce option originally. Fixed. I would like to try again. I think I'll try to run a loose strategy by someone this time to make sure I'm making sane decisions. What are the required pieces/DLCs, etc.? I would be interested, but won't steal a normal person's spot. Can we win on Immortal though? Once they spam out cities, we die pretty quickly. I think all we'd need are Brave New World and the Mongol DLC. We must win to restore our honor. But there are some variations to other rules we can try. One thing that did help us last time was a small map to constrain their growth. 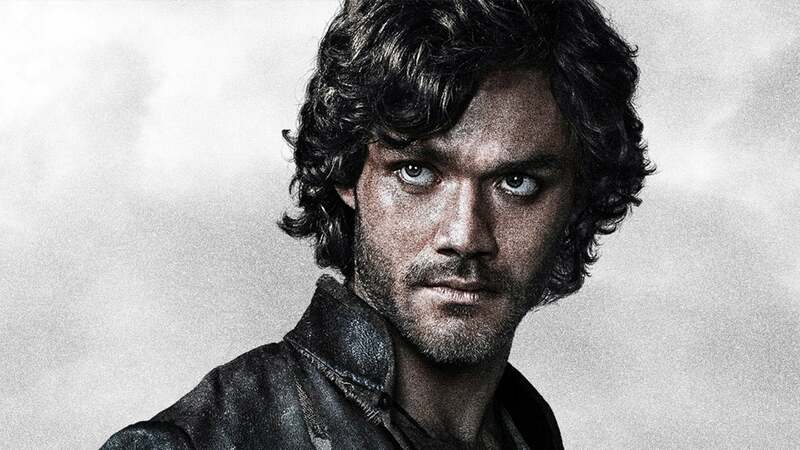 Another variation: Marco Polo vs. the Dickbot Horde. If we were all Venice, we could turn off one city challenge to allow us to buy city-states. One of the Mongol's advantages is a bonus vs. city states, so our interest in preserving them would actually be a nice counter-point. If we start before get to Germany, Joe will be taking my first couple turns. Whoa, let this one slip for awhile. Is there an option to make teams group together without an island map, like east v. west on the grasslands? I've never tried any of the maps of that style, and I'm not certain how they work. I've done some testing, and apparently the only way to do this on Great Plains is to edit the map in world builder and manually place starting locations. I'll do that if that's the map we prefer. 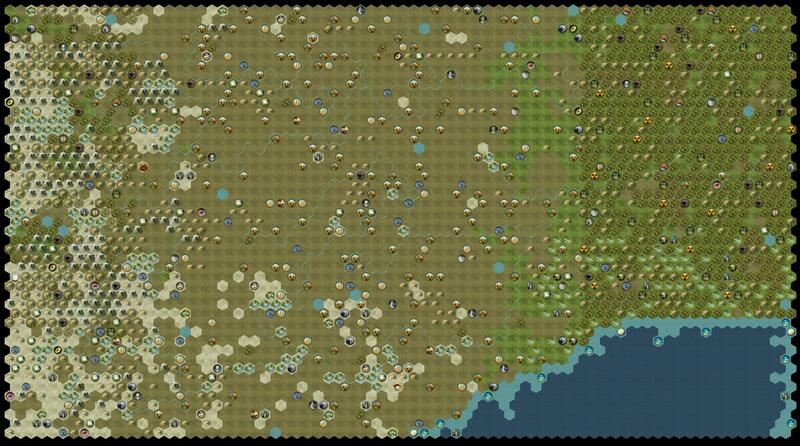 I'm not as crazy about the terrain after I loaded it up, though. The hills/jungle/swamp bit in the east is kind of lame. 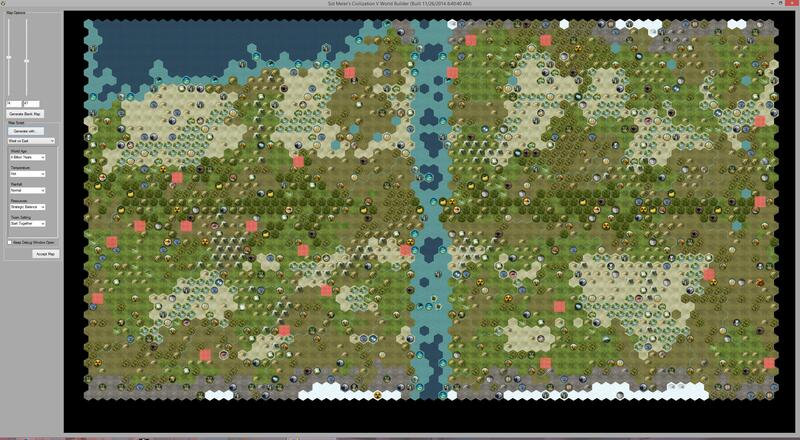 Below are screencaps of Great Plains and three alternatives. Which do people like? Note that these are all much bigger than the size we will play on. What do people think about this option? Please reply and rank the maps in order of your preference. 1 is most preferred. I guess I should start this, huh? No one city challenge beyond the Venice rules. Buy your way to victory against the dickbots! Immortal, 6v6, rules from top post, yada yada yada. I'll see if I can't get the game set up correctly and invites sent. I think I got in. Hey it's only been since... okay it was March when I proposed this. Hopefully I get around to building my city walls before the Mongolians come. I'm guessing it wouldn't hurt to start the game and assign Tushon to Venice, right? Haven't run a GMR game before and didn't want to mess it up. Tushon is at camp, not sure of schedule. I tried to get on the internet enough to login and choose game. It was bad. reallllllly bad. Thanks for the effort, @Tushon! GMR's website is bad enough even on a good connection. I'll start this game tonight. 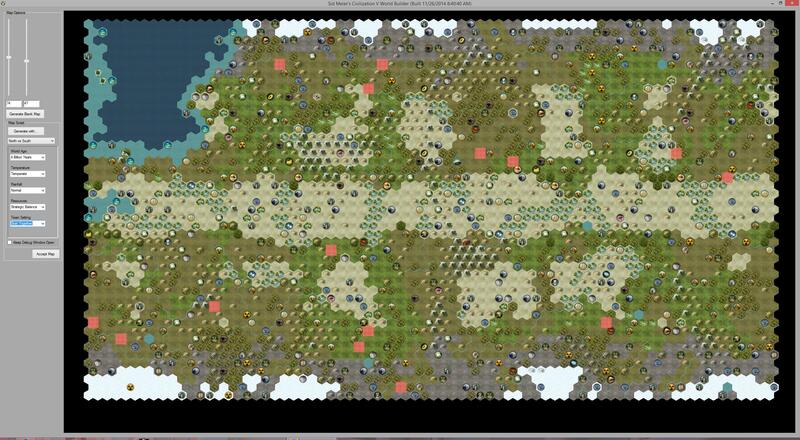 It looks like perma-war needs to be done with a save editor or a custom map, right? You can just choose it in the game settings, right? or did I add that mod so long ago, I forgot it was a mod? How have you folks started Dickbots games with the options we've had? Game settings have no option for perma-war when starting hot seat game. Game settings have no option for no religion when starting hot seat game. Number of Civs is locked to map size. How do I make a small sized map with 12 players? Thanks @PirateNinja, that sounds like it should work for the perma-war and no religion. I think @Basil set up the last Dickbots game. 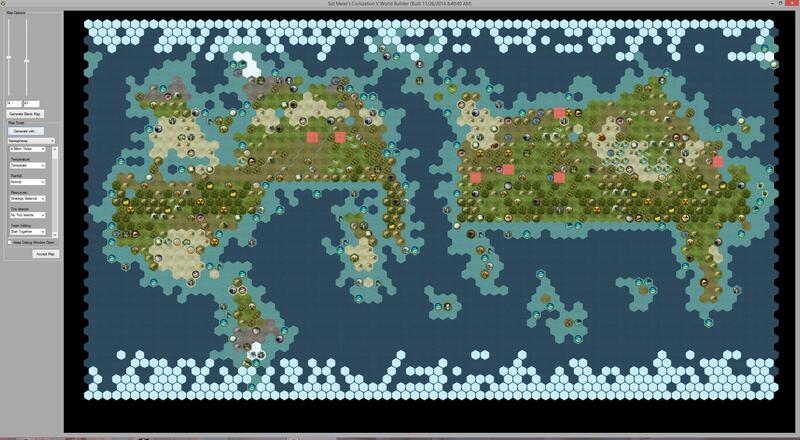 How did you get so many Civs on a tiny size map? Did you have to make a custom map? Modify the relevant XML file. Awesome. So if I make changes to the main (non mods) XML, then start game, I should be able to revert the changes afterwards without breaking the game, right?